Yan Shen outside CTI on Centennial Campus. Photo by Katie Harris. Yan Shen grew up in Haining, a city in eastern China’s Zhejiang province, and attended Zhejiang University for her undergraduate and master’s degrees in educational technology. Since this was a new field in China, Shen studied a variety of disciplines from education to computer science to art and design. She became interested in instructional design and learned many theories but never got to see it in action. “I was really curious as to what instructional design looks like in the real world,” Shen said. To continue her studies, Shen and her husband, Min, came to the United States in 2007. 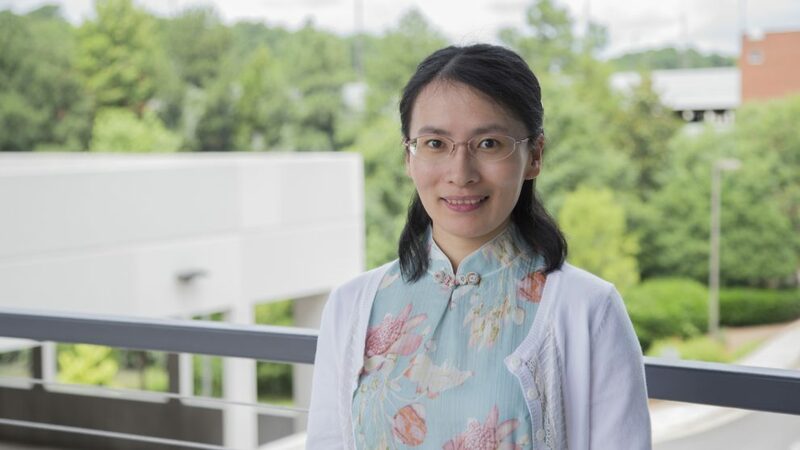 Shen began her Ph.D. program at the University of Georgia, working with Michael Hannafin, Ph.D., as her advisor. Her research was focused on scaffolding higher-order thinking using technology. 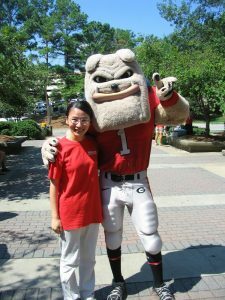 Yan and UGA’s costumed mascot, Hairy Dawg. A month after her Ph.D. graduation in 2012, Shen saw a posting for a temporary instructional designer position at DELTA. 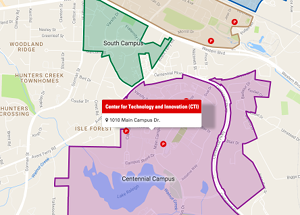 She began in July 2012 and transitioned to a full-time instructional designer in April 2013. Shen has been interested in projects focused on active learning. “I’m a strong believer in learning by doing,” Shen said. Many of her projects have been emphasizing the design of the learning activities. With her training in educational research, she is also interested in the evaluation aspect of her instructional design. As a lead instructional designer, Shen explained she works with people from teams across DELTA to create innovative instructional products for a variety of courses. What has been one of your favorite projects? Shen’s current project is a biochemistry course using two integrated approaches — flipped learning and self-regulated learning. She noticed self-regulation is a piece that’s often missing and students need this type of support to be successful in a flipped classroom. “I am coming up with a list of strategies that might be reused in future courses, and we are definitely doing some evaluation with those strategies,” Shen said. What makes your job special and what do you enjoy most? In addition, Shen said it’s not just the content she is designing but the way students are actually learning, processing, and applying the knowledge. She also enjoys working with people who have expertise in so many different areas. “I just feel like this is the perfect world. It’s not like one person has to know everything. Working with people who have different expertise, you can go much deeper using everyone’s knowledge,” Shen said. Yan’s kids, Charlie and Julia. 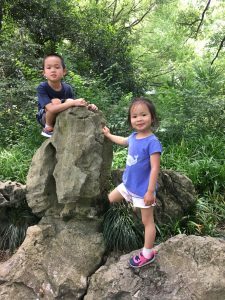 “My kids are my world outside of work,” Shen said. She has Charlie who just turned 7 years old and finished first grade and Julia who recently turned 4 years old and started pre-K.
Charlie is a LEGO® fan, so Shen will spend time building with him. She is proud that he can follow the instructions and build the structure by himself. She is working with him to be more flexible, especially in his LEGO®-building adventures. Shen’s youngest Julia loves to play pretend. Shen is often recruited to be a teacher and have a show and tell with Julia and Charlie. “Charlie loves all kinds of farm work. He would be a good farm boy if he grew up in Wangjiang,” Shen laughed. Shen’s hometown of Haining is a city in the Zhejiang province that changes and seems to add new high-rise buildings every time she goes back to visit. 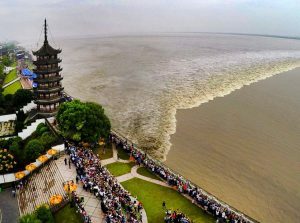 Her hometown is famous for tidal waves from the Qiantang River. There’s even a festival every year for watching the tidal waves that attracts quite the crowd. “It’s the best place in the world to see the tidal waves,” Shen added. Shen explained the name of her hometown means “Hai (the sea) Ning (is peaceful),” a wish of people from the ancient times. What is something about yourself that people may not know? During her time in college, Shen spent a lot of time as a web development contractor. “It was around the mid-2000s when the internet had become increasingly available in China but not all companies or departments at the school had a website,” she said. 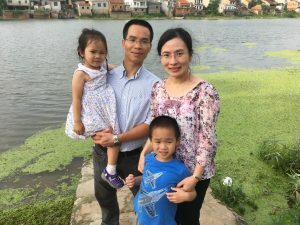 Yan’s family on a trip to China. “Also, this might be fun — that’s how I met my husband!” Shen said. “He is a software engineer who had a small company at the time and was looking for someone to develop a website.” The pair attended the same university but at different years, so if it weren’t for Shen’s web development skills, they may not have ever met.